Beats by Dr. Dre Pill Plus review | What Hi-Fi? Remember when Apple took over Beats Electronics in 2014 in one of the biggest tech deals of all time? Well, following the hurried closure of Beats Music – the beat goes on with Apple Music, of course – the tech giant has decided to be more gentle with Beats’ hardware. The new (fourth) Beats Pill speaker stands as the first product released under the Apple umbrella – ironically, the original Pill was one of Beats’ first self-developed products after parting with Monster back in 2012 – and unsurprisingly has been well and truly Appletized. At first, you might not even be able to tell. Opting to stick with the familiar Beats’ branding you see on every tube journey, Apple has refrained from brandishing its own logo. The fact its ‘Plus’ moniker now coincides with that of Apple’s iPhone 6 Plus may be a coincidence, but what’s not is the switch from microUSB to Apple’s lightning connector for charging, so Appleites need only carry a single cable around for both their phone and speaker. More in keeping with Apple’s design language, it’s had a facelift for an all-round slicker, cleaner design. Not only have volume, power and the multi-purpose button now moved from the side to the top, the sockets to the rear are now covered: peel back a rubber flap a little to uncover the charging socket, or the whole way to get to the 3.5mm input and a USB socket to charge your smartphone. Disappointingly, this doesn’t make the Pill+ waterproof though, so don’t take this pill with water. A few small dot lights by the power button shows battery level too so you’re not caught out abruptly mid-song. Apple has stripped the pill of any colour (for now, anyway), ditching the heritage blue and red finishes and going with just classic black and white. No sign of the rose gold finish yet though. Otherwise, the Pill+ is a close copy of its predecessor, its capsule-shape fusion of mesh grille and rubber defying the hoards of plastic-tastic rivals out there. Apple hasn’t just sought to make the Pill its own, it has made it better too. While the older version claimed a seven-hour battery life, the Pill+ should party on for 12 (at low volumes, anyway) from a three-hour charge. Like the old Pill, you can double the dosage by pairing two together, either for a stereo performance or simple multi-room experience. But instead of using NFC to do it, this time a dedicated app – only Apple’s second Android app, alongside an iOS version of course – facilitates pairing, much like with the UE Boom and Megaboom. 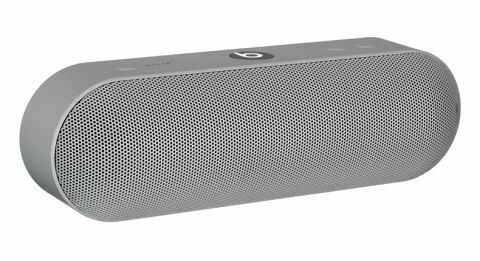 Just check your Android device’s compatibility, as one of our review team was unable to download the Beats Pill+ app on an LG G4. The app unlocks more features too: a DJ mode lets two smartphones or tablets connect to the app to control the speaker so you can counter your friend’s questionable playlist with your own. Slightly larger than the original Pill and with two new tweeters sandwiching two bigger woofers, the Pill+ is all about creating a bigger, fuller sound. Apple claims midrange performance has improved too. It’s encouraging news. Sound quality has always been the Beats Pills’ Achilles heel and while we hardly need yet another portable Bluetooth speaker, there’s always room for a good one. First impressions are positive. Its big, solid sound counters its predecessor’s thin, wispy presentation, with balance pleasingly on the straight and narrow. Those larger drivers and off-angle tweeters do a good job of throwing David Bowie’s Suffragette City out far and wide, taking the bass guitars between the teeth and affording them good weight and depth. Decent drive and agility make for a feisty, charged rendition, and that’s met with clarity and fair detail across the board, even if we feel vocals favour solidity over absolute transparency. At low volume, the Pill stays poised amid thrashing cymbals and electrics in Wolf Alice’s You’re a Germ, but as the volume goes higher it loses its cool, resulting in a fair amount of distortion. The UE Boom 2 (£120) has more composure, as well as greater expression up its sleeve. Play Bright Eyes’ We Are Nowhere And It’s Now and it’s capable of a more emotional, intelligent execution, better communicating the quiver and dynamic inflections of the vocals. When we find ourselves favouring the Boom 2 at every comparison, naturally our performance-per-pound alarm bells start ringing. It’s a bitter pill to swallow for Apple, which has no doubt improved an average speaker line living off the brand’s street cred – just not by enough. Features pass the test, but sound quality struggles to make any sort of impact in such a bloated market. At £190, this particular Pill is hardly what the doctor ordered.